It is that time of year again ya’ll! The hot summer air comes to a nice cool temperature, the leaves started changing colors, and of course our favorite brands roll out the red carpet for all the new swag. Alpinestars is bring us the new SP-5 Gloves. The Alpinestars SP-5 Gloves are going to be in a similar wheelhouse as the SPX Air Gloves, the GPX Gloves, and perhaps the Celer. Of course these gloves all have their differences and pros in cons for various categories so let's get into the guts of the SP-5. The gloves consist of a premium, full-grain leather palm construction, top hand built with high performance synthetic leather associated with perforated goat leather, Alpinestars’ patented third and fourth finger bridge, as well as a nice pre-curved finger construction to help reduce rider fatigue. Did I mention the Alpinestars SP-5 index fingertip and the thumb are touchscreen compatible? Well, they are! You gotta keep that selfie game strong while you are ripping down the highway at 100mph (please don’t do that). While I hate that summer is ending, as most of us I am sure are, at least we have some new gear to look forward to. 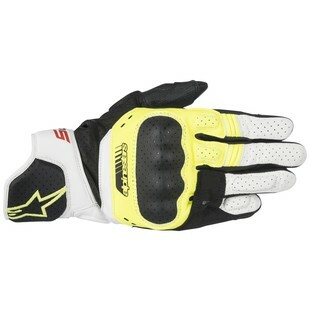 Keep an eye out this fall for the new Alpinestars SP-5.